Star Traders 4X: Red Sector Ahead Captain! Like any good Star Traders game, ST 4X will feature red and green sectors with major tactical and ship management impacts. Fuel use in Red Sectors will drive up the cost of long distance naval engagements. Green sectors will provide access to services provided to your fleet by reliable Licensed Star Traders. 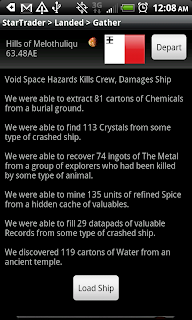 The characters you play in Star Traders RPG are a resource, research item and game feature in ST 4x.